I’ve switched to an iPhone as my primary mobile device because I’m dogfooding my new iOS app. Coming off of three straight years of Android, one of the toughest parts of the transition was losing the applications drawer. My new iPhone had so many screens of icons, all perfectly aligned in a grid, every one with rounded corners, all equal visual weight, nary a widget in site! I got dizzy swiping across the carousel of apps trying to find the one I needed. I decided to get all my apps onto 1 or 2 homescreens using folders that made it obvious what was where. By default, when you drag one app onto another to create a folder, iOS suggests a folder name based on the apps’ category, like “Reference”, “Music,” or “Productivity.” I tried this for awhile, but these category names were so vague they didn’t solve my problem, they just gave it a different shape. Instead of hunting for apps across homescreens, I pecked through multiple folders. (“Is Instagr.am in Photography or Social Networking?”) I look at my phone’s homescreen dozens of times a day, and I’m embarrassed to admit how much not getting it into a usable state bothered me. Thinking it through, I realized this category-based naming convention just doesn’t align with my basic mental construct of what software is. Organizing items by category makes sense in libraries and bookstores, on restaurant menus, in music and movies—but not apps. An app isn’t consumable media. An app is a tool. It helps you perform an action, to do something. Modern programming languages and APIs are verb-based (think MyObject->setName() and and HTTP’s GET and POST), and the user interface should be, too. That’s when I settled on a verb-based folder system. These tiny touchscreen mobile computers we carry around in our pockets are the ultimate multi-tool. I use my phone to read, shop, watch, listen, cook, play, navigate, share, jot, photograph, and chat, so I organized my apps just like that. The guiding question for where each app went was What do I DO with it? Here’s a screenshot of my first pass at a verb-based interface using folders on my iPhone. I’ve since learned how to put Newsstand into a folder, so I tucked it away in “Read.” I left the four apps I use the most on the Dock for one-tap access. Dr. Drang says I’m not going to like using folders, but after a couple of weeks and a few tweaks, I feel good about it. My brain has mapped the folder verbs I chose to the apps within much more naturally. I’ve since moved Instagr.am from “Photograph” to “Share” and that feels smoother than “Social Networking,” which makes me think of Jesse Eisenberg. In the end it’s all semantics, but simple, present-tense action verbs have a special power that all software designers should respect. 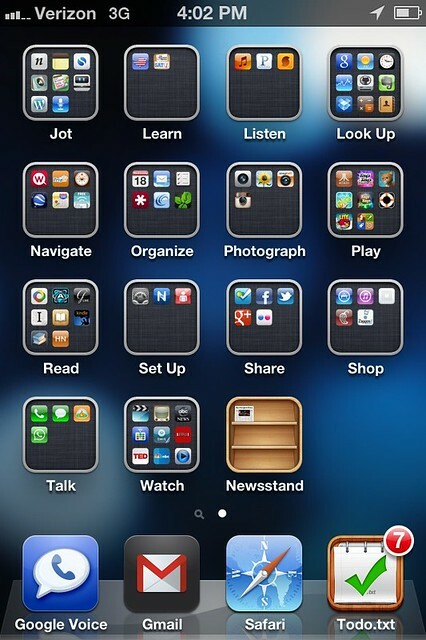 Since organizing my iPhone homescreen this way, I’ve been taking note of verb-based interfaces done well and not so well. 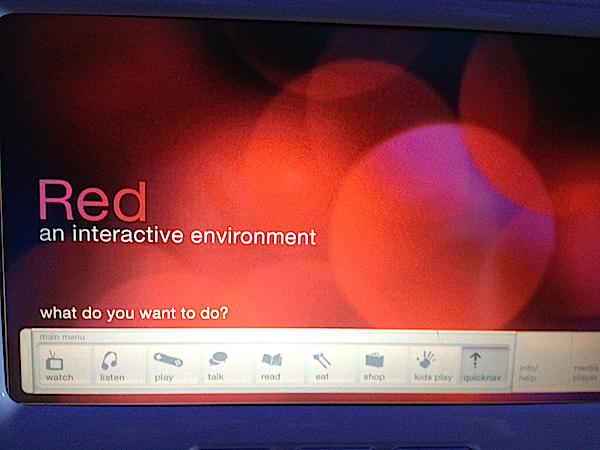 Virgin America airline’s Red system appears on the touchscreen on the back of every seat on their airplanes. The prompt reads “What do you want to do?” and the choices are “watch,” “listen,” “play,” “eat”, “shop”, and the one that breaks the one-word-verb pattern, “kids play.” Expand the quick nav and nouns are listed under each verb. (Under “watch,” there’s “on demand movies,” “foreign films,” “satellite tv,” etc.) Well done. While ThinkUp’s project page is verb-heavy, its user interface isn’t as much as it should be. As we iterate the app, we’ll do well to take some of this thinking into its future releases.